The Community Development and Knowledge Management for the Satoyama Initiative Programme (COMDEKS) was launched in 2011 to support local community activities that maintain and rebuild target production landscapes and seascapes, and to collect and disseminate knowledge and experiences from successful on-the-ground actions so that, if feasible, they can be adapted by other communities throughout the world to their specific conditions. The programme provides small-scale finance to local community organizations in developing countries to support sound biodiversity and ecosystem management as well as to develop or strengthen sustainable livelihood activities planned and executed by community members themselves. The target landscape selected as the focus of COMDEKS activities in Costa Rica is the Jesús María River Basin, located in the country’s Pacific region. The target landscape selected as the focus of COMDEKS activities in Costa Rica is the Jesús María River Basin, located in the country’s Pacific region. Spanning 35,280 ha, the region is a diverse landscape comprised of forests, coffee and fruit trees, mangroves, pastures, plantations, water bodies, and urban areas. The Jesús María River Basin consists of several sub-basins, including the Paires, Jesús María, Surubres, Machuca, and the Cuarros Rivers, whose headwaters are located between 1,000 and 1,440 m above sea level in the Constancia, Pelón, Berlin and Aguacate hills. Except for the Cuarros, these rivers converge in the flat lands of the Labrador in the lower part of the watershed between 80 and 120 m above sea level. The entire basin drains into the Pacific Ocean in the Tivives wetland (a Wildlife Protected Area, WPA), with its mangrove and estuarine system. Tivives is a wetland of great importance because it retains a variety of mangrove species, including the Red Mangrove (Rhizophora mangle); helps trap sediment transported by the rivers from the highlands; and regulates the entry of seawater. Moreover, it is a critical breeding ground for marine life, and is the basis for the livelihoods of artisanal fishers in the Gulf of Nicoya. The Jesús María River Basin is divided into three topographic zones covering different altitudes. The upper basin, between 440 and 1,440 m, makes up 19 percent of the total basin; the middle basin, between 220 and 440 m, makes up 24 percent; and the lower basin, which extends from 0 to 220 m, covers 57 percent of the basin. Upper Basin: The primary production activities in this landscape are coffee production and small-scale livestock breeding on the area’s pasturelands. The secondary activities are cultivation of corn, vegetables and ornamental plants. Approximately 3,000 ha of forest shade coffee are grown in this area, with some farms on fertile volcanic soils and others on degraded soils more prone to landslides. Land ownership in the area is characterized by small coffee farms of 2-5 ha in the hands of about 500 families. However, there are also some larger livestock farms for chickens, pigs and dairy cattle. This basin is the closest to the Central Valley and the nation’s capital city of San Jose. Middle basin: This zone is characterized by extensive jaragua pastures (used for cattle rearing on large farms), palms and trees in pastures, forest fragments in the central area (Cerro Surubres), river gallery forests, and about 4,000 ha of sugar cane and fruits such as mango, avocado, sapote and, to a lesser extent, citrus, acerola (malpighia), cashews and tamarind in the transept between Desamparados of San Mateo and Nances of Esparza. Large chicken and pig farms of 50-200 ha each, typically owned by farmers who do not live in the region, also appear in the Paires sub-basin. Lower Basin: Prevalent in this area are plantations of cucurbits (melon and watermelon), sugar cane, rice, papaya, pepper and tomato, as well as improved pasture for dairy and beef cattle, forest plantations and fruit trees. Various industrial plants are also found along the road corridor between Ceiba and Salinas (Route 27). The city of San Mateo and part of the city of Orotina are located in this lower basin, including various real estate developments for vacation homes of urban residents on lands that were part of a previous agrarian reform. There are also large livestock farms and agro-industrial production sites owned by large estates, which coexist with old plots dating from the agrarian reform process. Approximately 30 percent of the target landscape is covered by forests, which are mostly composed of secondary forest, teak plantations, and coffee and fruit trees. Apart from approximately 150 ha of mangrove forest at the mouth of the Jesús María River, no natural or primary forests remain throughout the watershed. Another 40 percent of the land comprises pastures and thickets, and the remaining 30 percent is urban areas and melon plantations. The upper basin of the target landscape consists mostly of small coffee plantations, where communities jointly organize their coffee production. This creates a diverse ecosystem of coffee trees, citrus, and trees planted for lumber, as well as pasturing of pigs and chickens. In the middle basin, fruits grown include mango, avocado, and sapote. This portion of the landscape is also home to various birds and small mammals, which coexist within the context of the commercial fruit production. The lower region stands out for the unique estuary and mangrove ecosystem, the majority of which has been razed in recent years. Due to deforestation, the area is facing increasing degradation, as well as pressure from reductions in freshwater availability. Throughout the basin, the loss of natural forest cover has left the landscape highly fragmented. Consequently, biodiversity loss has been substantial. Only small relicts of primary forest remain in the galleries of the main rivers and mangroves. The remaining forest cover comprises heavily managed and fragmented secondary forests, located in the upper reaches of the hills, with poor connectivity between these secondary forest fragments. Shade coffee, fruit trees and planted teak forests are also important elements of the remaining forest cover. The target landscape area occupies 14 separate diffusely populated districts within San Ramon, San Mateo, Esparza, Heredia, and Garabito counties. The region is characterized by high levels of interagency cooperation and coordination through a wide array of social groups, community farms and coops, and even various local sports teams, which collectively create a strong sense of community and empowerment on a local level. Furthermore, human development levels are considered moderate to high, so extreme poverty and food insecurity are not problems in the region. The main economic activity in the area is agriculture, with most production focused on coffee, rice, sugar cane, and fruit. In spite of its current productivity, there is concern that the environmental threats to the Jesús María River Basin will have adverse socioeconomic consequences. Parts of the surrounding landscape, such as the city of Orotina Esparza, are undergoing a rapid cultural transition with urbanization. The majority of employment is in the service sector of Greater Puntarenas, the nearest sizeable city. The cultural background is diverse and can be classified as a “mestizo” culture, the product of a mix of Indigenous, African and Sephardic Hispanic ancestors stemming from the colonial era. Landslides and soil erosion due to local topography: In the upper basin, steep slopes characterize the topography in altitudes between 400 m and 1,400 m. This accelerates the movement of runoff and sediment and increases erosion. In this part of the basin, the hydraulic structure follows a very complex dendritic pattern and rivers originate in volcanic formations of the Upper Tertiary. This is an area with high natural potential for soil erosion, where restoration of vegetative cover is a key issue, particularly within the coffee landscape. Poor design of infrastructure: In the upper and middle basin, public and private roads on steep slopes with insufficient vegetative cover are poorly designed, water drainage systems are inappropriately engineered, terrace cuts produce gullies, and maintenance is insufficient, increasing erosion. Road design and gullies must be addressed through multi-stakeholder governance platforms to plan, prioritize and involve national institutions responsible for roads and transport to undertake major engineering for infrastructure, retaining walls or geo-membranes. Deforestation and land degradation: The Cuarros River sub-basin has a less elongated shape than the other sub-basins; it is flat and therefore less susceptible to erosion. Nevertheless, historic deforestation for extensive cattle pastures and monoculture agriculture have made the Jesús María River Basin one of the most degraded watersheds in the country, according to the Advisory Commission on Land Degradation (CADETI). Livestock and agricultural activities in areas with steep slopes and poor vegetative cover have led to its further deterioration. The watershed requires immediate changes in production systems and improved management of small-scale livestock activities to mitigate further soil erosion and degradation, and to start recovering soil productivity. Loss of agrobiodiversity: The inhabitants of the basin are intensive commercial producers of crops like coffee, rice, sugar cane, fruit, cucurbits (melon, watermelon, pipián and pumpkins) and cattle. As food security is not a concern for the majority of farmers, most now concentrate on cash crops. The number of corn and bean growers and farmers growing for home consumption are getting fewer every year. Consequently, the agrobiodiversity of formerly integrated farming systems has rapidly been lost, and some native or traditional cultivars of maize, beans, mangoes, avocados, cashews, rice, papayas, coffee, cucurbits, peppers and other crops are now gone. Recovery of this lost agrobiodiversity is key to increasing the resilience of the target landscape. Lack of a basin-wide governance platform: The primary environmental governance challenge in the Jesús María River Basin is to establish a commission to organize and manage land and resource uses in the basin. This will require improving coordination among all agencies working for the restoration of the basin, as well as support structures such as ASADAS in the management of water resources, and the County Agricultural Centers (CACs) regarding issues such as Payment for Environmental Services, agricultural marketing, and management of organic fairs, among others. One of the main aims of the baseline assessment is to develop a country landscape strategy. In December 2013, a baseline assessment was conducted by the Association for the Organic Agriculture Movement of the Central Pacific (Asociación para el Movimiento de Agricultura Orgánica del Pacifico Central) in order to evaluate the state of the landscape and to identify key environmental and socioeconomic issues. The assessment was carried out through a series of consultations with local community leaders, as well as field visits across the region. Three workshops were held with local community members from throughout the watershed, during which a total of 105 local community leaders (31 women, 74 men) were invited to rate the state of the region using the Socio-ecological Productive Landscapes and Seascapes (SEPLS) Resilience Indicators to gain input from the community. The results from the consultation process and the draft Landscape Strategy were then presented in a final workshop with 40 stakeholders from the watershed area. The baseline assessment identified the need to improve the dissemination of scientific knowledge at the decision-making level and at the community level in order to improve the resilience and recuperation of the degraded resources. It also identified the need to take measures that could ensure the sustainability of the production activities at the local and regional levels, and to promote the use of new technologies and practices such as water harvesting, stone walls to prevent erosion, and the use of biodigesters. 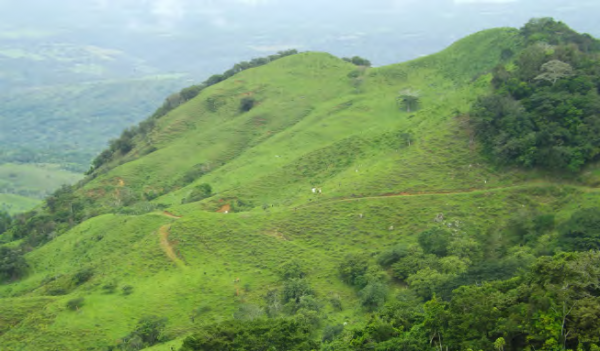 Using the landscape assessment as a basis, the COMDEKS Landscape Strategy for Costa Rica was developed. The Landscape Strategy describes and analyzes the landscape data and findings from the assessment, defines expected landscape outcomes and indicators that communities have agreed to jointly pursue, and outlines potential community-based activities to achieve these outcomes. The long-term objective of the Landscape Strategy is the development of sustainable socioeconomic production activities within the Jesús María River Basin through information sharing, capacity building, and restoration of the natural landscape. Table A-1 lists the four Landscape Outcomes around which the strategy is built, as well as performance indicators that will be used to measure these outcomes. Land degradation is comprehensively addressed through actions that prevent soil erosion and sediment transport to water bodies. · Number of hectares of coffee plantation managed under shade and organic agroforestry systems, with soil conservation works and vegetative ground cover management. · Number of hectares of fruit trees in agroforestry systems and integrated farms, with soil conservation works and vegetative ground cover management. · Number of hectares of pasture sustainably managed through silvopastoral systems. Forest cover throughout the river basin is increased through mechanisms such as Payment for Environmental Services (PES) and strengthening of local protected areas. · Numbers of hectares under forest cover (primary forests, reforested areas, natural regeneration, fruticulture, coffee cultivation, agroforestry and silvopastoral systems). · Number of farmers receiving Payments for Environmental Services as an incentive to maintain and increase forest cover. · Number of functioning biocorridors. 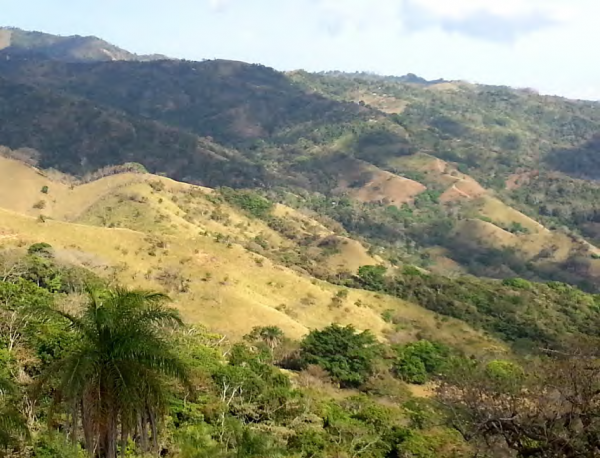 · Adoption of defined management plans for Tivives WPA and Biological Corridor Montes del Aguacate. 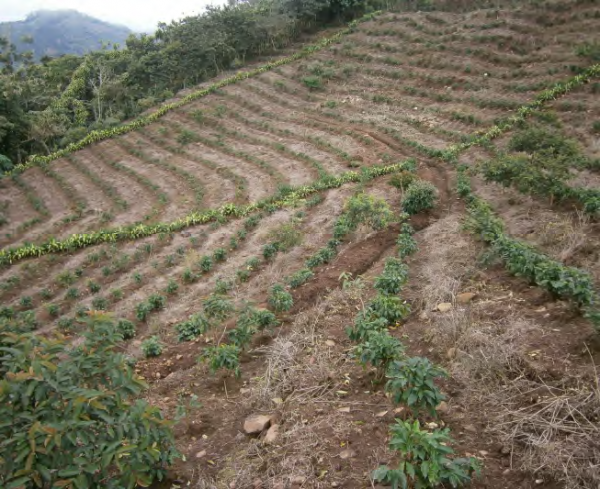 Sustainable agricultural production practices are established in the socio-ecological production landscape, including local coffee production in the upper basin, fruit growing in the middle basin, and integrated pastoral and agro-silvopastoral production in the middle and lower basin. · Number of hectares under organic and sustainable farming systems. · Number of rural communities working on sustainable production systems through integrated and organic farms. · Number of peasant families with at least 20% increase in income due to water harvesting and mini-irrigation systems. Scientific knowledge, traditional knowledge and technological innovation is strengthened and shared among producers, farm owners and the general public. · Number of new technologies and tools transferred to producers and farmers. · Amount of technical and scientific information about Jesús María River basin made available to the public. · Number of communities with improved lifestyle and livelihoods due to better access to drinking water. · Number of schools offering environmental education programs and organic agriculture training. Governance and landscape management capacity of local and regional organizations is strengthened in the target landscape. · Number of grassroots organizations strengthened through COMDEKS project activities. · Political steps taken to finalize Payment for Environmental Services in the target area with National Forestry Department financing. Negotiate with the Rural Development Institute (INDER) to correct the structural design of roads to prevent erosion. 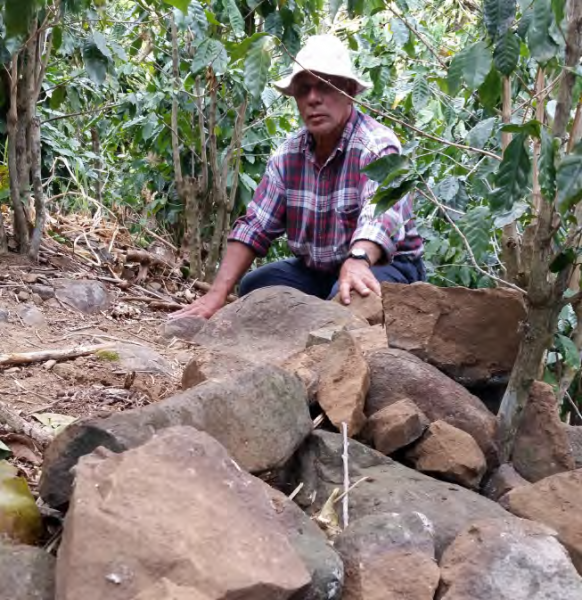 Institute soil conservation practices—such as contours, sediment traps and planting of woody plants and fruit trees—in coffee plantations. Establish integrated silvopastoral farms with shade trees in pastures, hedgerows, windbreaks, improved pastures, and water sources for the animals. Conduct tree-planting campaigns and restore riparian forests throughout the basin. Distribute Payments for Environmental Services (PES) in the middle basin for planting trees in water protection areas, and fruit trees throughout the landscape. Distribute Payments for Environmental Services in Agroforestry Systems (PSA-SAF) in coffee plantations in the upper basin. Diversification of production units by creating comprehensive, sustainable and high resilience farms. Conservation of water through systems of rainwater harvesting, small dams and water intakes for drip irrigation, and reducing the water quantity used for livestock and fishponds. Development of responsible certified organic fairs and markets for sustainable products; increase value-added for coffee and fruits and fruit processing factories. Promote environmental education programs on organic production and soil conservation in all schools in the basin. Protect forests in recharge areas and purchase properties that are water sources for communities, with support from INDER. Strengthen infrastructure for water distribution by enhancing water intakes and constructing water tanks, rural aqueducts, and water management and maintenance offices. Strengthen interagency coordination among all agencies working on the restoration of the basin to streamline different initiatives into a single strategy. Based on this guidance, five local projects were selected as part of COMDEKS Costa Rica’s portfolio of landscape interventions in the Jesús María River Basin (see Table A-2). Each is led by a different community-based organization, with grants ranging from US$30,000 to US$50,000. US$50,000 Outcomes 1, 2, 5 Construct runoff water reservoirs in agricultural production areas and reduce erosion in the basin from planting and harvesting. About 25 producers in the upper middle part of watershed will participate by implementing water harvesting to channel agricultural runoff water. US$50,000 Outcomes 2, 3, 5 Replant native timber species in the region as well as fruit trees that provide medium-term continuity of commercial activities and improve community living conditions. About 20,000 trees will be planted in the watershed every year for four years to help rehabilitate degraded areas of the basin. US$50,000 Outcomes 1, 2, 4, 5 Restore degraded lands by instituting silvopastoral systems that help reduce soil loss. About 150 producers will participate in training courses, on-the-ground practice sessions, experience exchanges, and peer-to-peer learning sessions on implementing silvopastoral practices, thereby generating environmental benefits on their farms, as well as in the basin as a whole. US$50,000 Outcomes 2, 3, 5 Mitigate soil degradation by initiating agro-conservation practices. About 45 local producers will participate in training courses and experience sharing on soil conservation practices to implement on their farms. 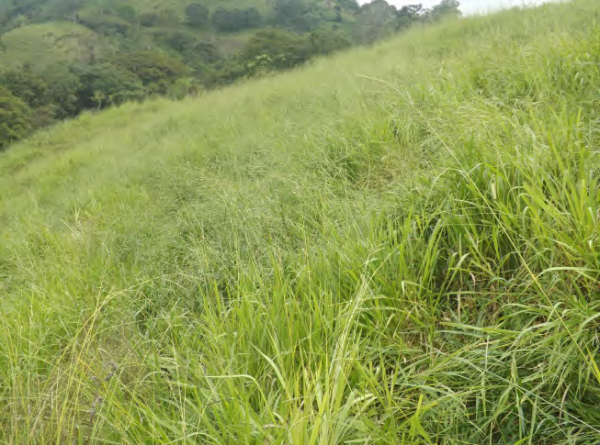 Some soil conservation techniques being implemented include guard channels, hillside ditches, application of organic fertilizers, application of calcium carbonate, constructing individual terraces, and instituting agroforestry systems. All these practices will be systematized for the development of a practical user manual for other producers in the basin and other regions. US$30,000 Outcomes 1, 3, 4, 5 Promote the switch to organic production, including training of farmers in organic production techniques. Approximately 75 producers in the basin will receive training in organic farming and will implement the lessons learned on their farms as a demonstration model of organic production suitable for other producers in the basin. Restoring and reconnecting basin forests and generating income: To restore and reconnect forest ecosystems in the river basin, communities have planted some 54,000 trees in degraded forest areas. Many of these are species of native hardwood trees, but at least 20,000 are fruit trees common in the area, including mango, cashew, loquat, sapote, guava, star apple, citrus, and avocado, with another 20,000 fruit trees slated for planting each of the next three years. Produce from these trees has provided farmers the opportunity to participate in local farmers markets, creating another income source. Planted trees have also provided other services, such as providing shade for cattle, and creating wind breaks for crops to reduce soil erosion. Trees for reforestation are grown in a new government nursery, with local farmers participating by collecting fruit tree seeds to be raised at the nursery, and also participating in tree grafting in exchange for tree seedlings. Tree planting, along with installation of 5 km of fencing, has also been a key strategy in protecting river banks, springs, and headwater areas from farming and cattle damage. In addition, 13 farmers have each agreed to set aside 1 ha of their farmland for forest restoration in exchange for annual PES payments from the government. Reforming grazing practices and diversifying income: To mitigate the soil degradation problems faced in the middle basin, zero-grazing livestock production systems have been put in place along with the implementation of silvopastoral activities, such as live fences, and the construction of silos and paddocks. To date, some 150 structures have been built for stabling cattle in zero-grazing systems and storing fodder to feed them. Fodder banks planted with species such as sugar cane and maralfalfa grass have been established to help provide high-quality feed for livestock during the dry season. Planting legumes as fodder crops also increases yields of subsequent vegetable crops due to their nitrogen-fixing ability, which will be increasingly important in areas where population pressure exists. About 313 hectares of land have been dedicated to fodder banks by producers so far. One side benefit of the zero-grazing systems and reorganization of livestock farms has been the diversification of income-generating activities on these farms. Some livestock producers have begun to produce organic fertilizer for sale, to make cheese, and to process fruit to augment their livestock incomes. Harvesting, storing, and managing water for agriculture: Farmers have started using new techniques for harvesting and conserving water using rainwater, small dams and water intakes in spring areas. The water is used for drip irrigation, mini-irrigation, watering livestock, the cleaning and maintenance of pigsties, and to feed aquaculture fishponds. In addition, 12 out of a planned 25 water reservoirs have been constructed for on-farm water storage, with local Community Water Committees identifying the appropriate location for the reservoirs. These small reservoirs, designed by university graduate students, are built to provide water for agricultural activities during the dry season. Implementing soil conservation measures: Through a systematized and practical training module on soil conservation practices, producers have learned techniques such as building guard channels, constructing soil terraces, and applying organic fertilizer. There are now some 99 miles of ditches built to prevent soil erosion, promote water infiltration, and address soil degradation in the target landscape. Promoting organic agriculture: Some 280 farmers have received training in organic agriculture systems and have visited demonstration projects in southern Costa Rica to exchange best practices. In addition, an environmental education curriculum was introduced at six elementary and high schools in the area, in which students were trained in organic agriculture. Many of these schools have created an organic gardening area in which to practice these skills, with the crops raised there used at the community dining halls. Documenting, organizing, and making available information on sustainable production practices: Several knowledge products have been assembled so far for use in different applications. One is a toolkit for Agricultural Extension Agents that documents 44 sustainable production practices implemented in COMDEKS projects in the river basin. In addition, an alliance between COMDEKS project leaders and three government departments produced a planning tool that famers can use to track their farm production, and which also disseminates soil conservation practices. Another alliance with the academic institution CATIE produced a series of documents that documented traditional and scientific knowledge about best practices implemented in the target landscape. Experience from COMDEKS projects, combined with experience from previous projects funded by SGP Costa Rica using the same community-based ecosystem management philosophy, have produced a resident population with significant social capital and technical experience with landscape projects and measures of landscape resilience. Field visits and exchanges of findings and results among COMDEKS communities have augmented this fledgling landscape community. In addition, many partnerships with government departments such as the Ministry of Agriculture and the Ministry of Environment, the National Learning Institute, and others, have offered a base of support services and training to communities in the area. This offers a good basis going forward for landscape governance and continued community-led projects to restore resilience and support sustainable livelihoods. Efforts are also on-going to create a basin-wide land and resource governance platform that will legally empower communities to bring their landscape experience into the decision-making realm. This would take the form of a Jesús María River Basin management committee, including both civil society and government representatives. 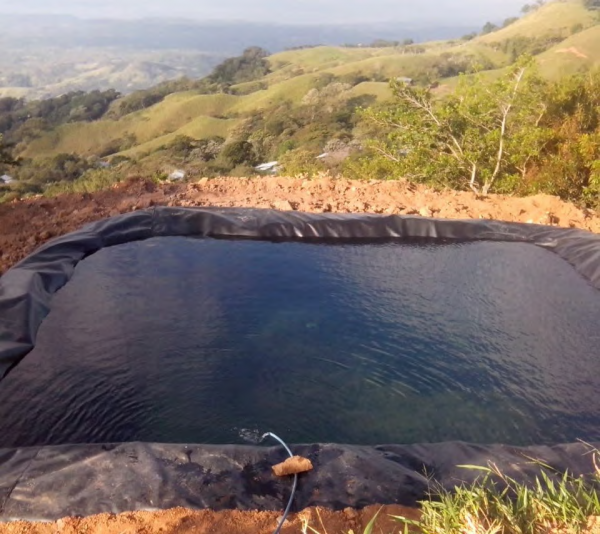 The baseline assessment for COMDEKS Costa Rica demonstrated that communities in the target landscape lacked awareness of erosion and land degradation problems. The assessment highlighted the need to improve the dissemination of scientific knowledge at the farmer level—the most immediate level of decision-making in the landscape—to ensure the sustainability of productive activities at the local and regional level, and to promote the use of new technologies. This insight framed many of the COMDEKS project plans. Soil salinization is another critical issue that needs to be dealt with, as is soil erosion on river banks, mangrove sedimentation, sediment clogging at the river mouth, flooding, and changes in river mechanics (river course and meanders). Further promotion of silvopastoral livestock systems, as well as other activities to prevent salinization and erosion, should be looked into in planning future community projects. Increasing forest cover and stabilizing riverbanks with fruit trees will likely have a positive impact on the socio-ecological production landscape. However, caution is called for in tree selection. Using commercial fruit tree varieties of mango, avocado and cashew result in greater fruit production, but at the same time the seeds of traditional varieties (landraces) are being lost or forgotten. The sustainable agricultural production practices promoted in COMDEKS projects were designed based on the specific characteristics of the river basin: local coffee production in the upper basin, fruit growing in the middle basin, and integrated pastoral and agro-silvopastoral systems in the middle and lower basins. This land planning scheme was developed in collaboration with local producers and technical personnel of the Ministry of Agriculture to ensure that locally appropriate practices to prevent soil degradation are implemented. Such essential collaboration is anticipated to continue and even increase in the future. One way to encourage farmers to participate in the government’s Payment for Environmental Services program, in which they set aside one hectare of their land for forest conservation in exchange for a yearly payment, is to have them sign a voluntary agreement. Although this agreement is not legally binding, it provides a helpful formality that allows the farmer to better visualize this as an economic and environmental opportunity. The upper basin is the most homogeneous area in the target landscape in terms of culture and produce. Producers all come from the same cultural background (called Cartagos, or whites from the West Central Valley), and have been farming a single crop—coffee—for over a century. This relative homogeneity has allowed them to work together in an integrated and cooperative manner and to be open to adopting new technologies and other innovative solutions that could increase their crop production. It has also made them interested in acquiring new knowledge on the cultivation of other crops and their associated ecology.